Prepare your squash by cutting off the ends, cutting it in half, and peeling the half of the squash that you plan to use. 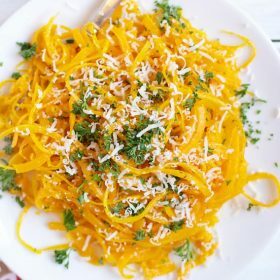 Load the squash on the spiralizer and spiralize the whole half. You can also use a peeler to peel the squash into long thin, noodle like, strips. Using clean kitchen scissors, roughly cut the noodles so that they are about the same length as traditional pasta. Place the noodles on a baking sheet, drizzle with olive oil, sprinkle with S&P, and toss the pasta to coat it all. Bake in the oven for 10-12 minutes until the pasta is tender but not crispy at all. Plate the pasta on 2 plates and top each plate with half of the butter, half of the parsley, and half of the cheese.